(5). 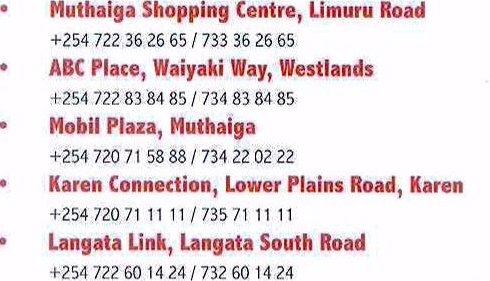 Muthaiga Shopping Centre, Limuru Road. All branches are managed by professional and experienced staff who will cater for all your foreign exchange requirement. We offer very competitive rates on buying and selling of all major foreign currencies and in addition, we also provide banking and delivery services. Buying and Selling of all major foreign currencies. Purchasing of Personal & Company Cheques (US Dollar /British Pound, Euro & CAD). Conversion of Foreign currency cheque to foreign currency cash. Very competitive rates on drafts and telegraphic/ swift transfers.